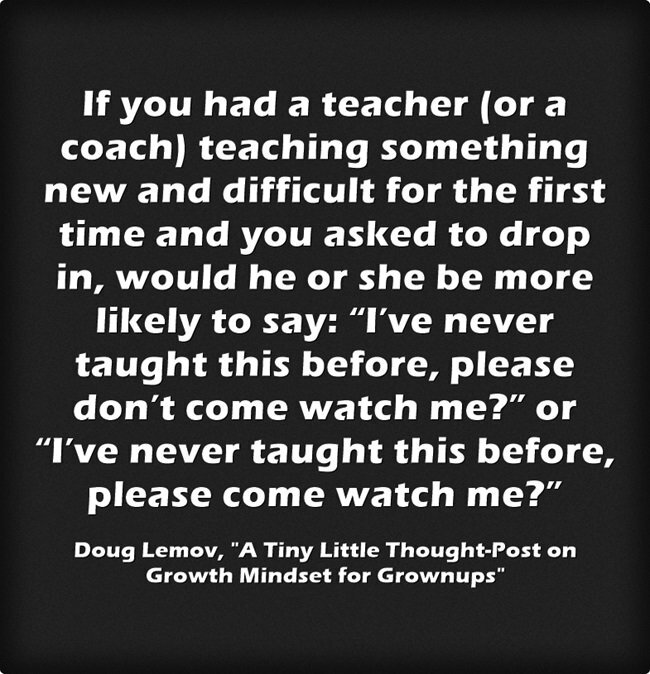 Doug Lemov has published a good short post titled A Tiny Little Thought-Post on Growth Mindset for Grownups. Certainly, much of what contributes towards answering that question comes from if a teacher has a growth mindset or not. By the same token, I’d suggest as much a contribution, if not more so, comes from the kind of leadership exhibited by administrators. We’re luck at our school that our previous and present administrators have promoted and do promote the kind of professional culture where I think many teachers would ask Doug’s second question. I wonder how many other administrators create the same kind of atmosphere? I fell kind of lucky that both my previous school and my current school leaderships created the atmosphere that makes me fell they are coming to help me do a better job. I dare to use all sorts of cutting edge technology to make my lessons more engaging to the students. I was so daring because I know if I got stuck in the middle of the class, I always can send one of my students to my supervisors’ office to ask for help. When I was trying my new methods of “Debate”, I was having trouble on how to engage everybody, not only one group of students. I asked my supervisor came to observe and she gave me super good ideas on how to divide the students into several groups and started to debate at the same time. From then on, my debate activity is very engaging and fun. In my new school, at the beginning of the school year, I was trying to figure out the pace for my level 2 classes. So I asked my supervisor to observe my level 2 class, and of course she gave me fantastic suggestions on the pace and how to engage students with different levels and different learning style. Now I fell I am on the right pace with my level 2 classes. I think the supervisors who come to observe my classes are on the same team with me: help our students to learn better. I would like them to observe a class or a lesson which I need help. I appreciate all the suggestions my supervisors gave me. I ask for suggestions from anybody who observe my classes and appreciate any suggestions they could give me to make me a better teacher.